Try late summer tomatoes in a fresh, refreshing soup. A ripe tomato is food marvel for its health benefits alone. It’s their redness we have to thank, or more specifically, lycopene, the pigment that gives fruits like tomatoes, watermelon, guava, and pink grapefruit their color. Lycopene is in the family of pigments called cartenoids (another famous carotenoid: the beta-carotene that makes carrots orange), which work as antioxidants to protect the body from the free radicals that degrade your organ tissues. Lycopene is one of the most powerful antioxidants in the cartenoid family and it’s especially abundant in tomatoes. Thing is, the human body cannot make carotenoids, so eating them is your only way to reap their benefits. This season plunder your garden or farmers market for some fresh, rosy red tomatoes and blend them into a batch of gazpacho. The chilled soup originated with the Andalucían people on the sweltering southern coast of Spain—they created gazpacho as a refreshing supper you can sip. You’ll be pleased with how quickly you can make a batch with just a sharp kitchen knife and a blender. 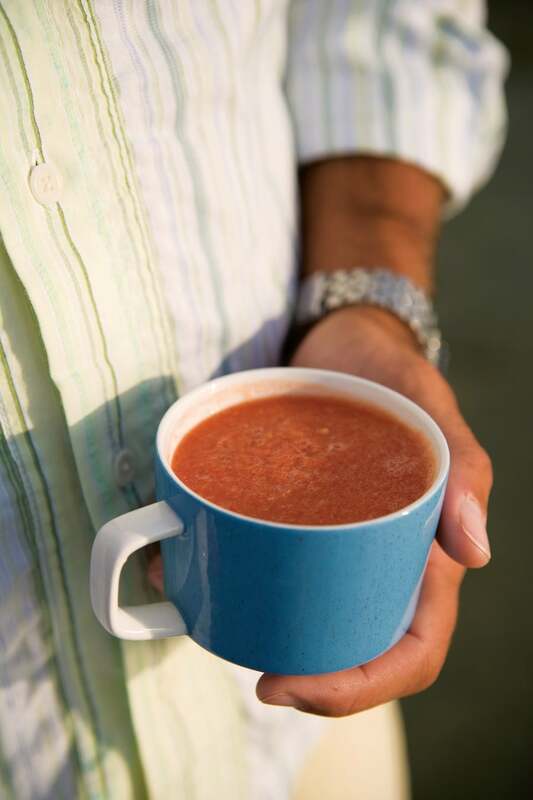 We think you’ll love the bright, tangy flavor and the sunny orange-red color that gives gazpacho its healthy punch. Place tomatoes, cucumber, yellow pepper, red pepper, onion and garlic in a blender and add French bread after squeezing out excess water (the bread gives the soup its body). Add tomato juice. Blend briefly or until soup is a thick purée. Pour mixture into a pitcher; add vinegar, olive oil and a dash of salt and pepper and stir well. Chill and serve in mugs or glasses for sipping.